When I was in high school, one-inch buttons were all the rage. I had a small collection of my own at the time; a collection that has, sadly, been mostly lost to time. Still, whenever I’m in a coffee shop or otherwise walking around town, I enjoy spotting the occasional backpack or purse plastered with the tiny buttons. Perhaps that’s why my interest was piqued when I learned about Inch x Inch (via a post on the Three Staples blog) a couple of years ago. 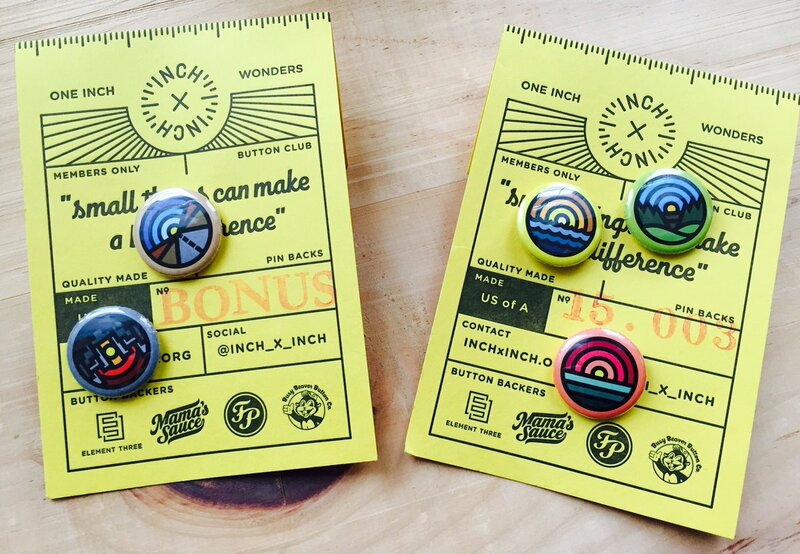 Inch x Inch is a monthly button subscription service whose proceeds go to charities that support youth art education. Every month, Inch x Inch finds an artist to create a new 3-pack of one-inch buttons, and for $50 those buttons will show up at your door for a year. I really enjoy the day each month when the little, yellow Inch x Inch envelope appears in my mailbox. Since Inch x Inch collaborates with so many artists, it’s always a fun surprise to see the design variations. I’ve gotten buttons with little skulls, donuts, and pig snouts, for instance. But one of my personal favorite sets is from the month Aaron Draplin (of Field Notes fame) created a pack done in his “Thick Lines” style. In the time that I’ve been an Inch x Inch subscriber, I’ve formed a small tradition. Every month I choose one of the new buttons and attach it to my work bag. Others I often give away, and the rest go into a box that houses a rebuilt button collection. Of course, the charge could be made that subscribing to a monthly button service is a bit frivolous, but the fact that the money goes to a good cause at least provides me with a decent excuse.